The European crisis created in April 1877 by the Russian advance towards Constantinople underlined the precarious future of the Ottoman Empire. Acquiring some territorial compensation in the Eastern Mediterranean to offset Russian gains became a matter of urgency for Britain, as Russian influence flooded through the Balkans and the Caucasus. The subsequent secret treaty, which legalised the British occupation of Cyprus, was a defensive alliance with respect to protecting the Asiatic provinces of Turkey from Russian encroachment. 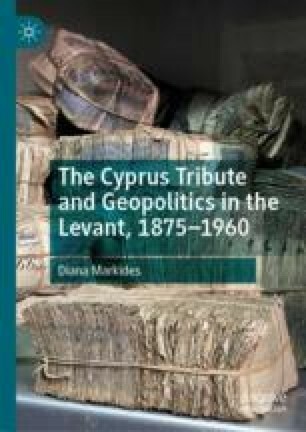 Lorans Tanatar Baruh and Alexander Apostolides, ‘The First Bank in Cyprus: The Imperial Ottoman Bank’, New Research. https://www.academia.edu/12442854. Sir Robert Hamilton Lang (Biographical details), The British Museum. https://www.britishmuseum.org. Sir Robert Hamilton Lang (Biographical details), 201.